Armidale Regional Council Mayor Simon Murray, left, Northern Tablelands MP Adam Marshall and Guyra Citizen of the Year Dot Vickery discussing plans to upgrade Guyra’s Mother of Ducks Lagoon. GUYRA’S Mother of Ducks Lagoon and Nature Reserve is a much-loved recreation space for locals and visitors and now there’s a plan to ensure its natural beauty remains undiminished and the community facilities are upgraded for the future. Northern Tablelands MP Adam Marshall is throwing his weight behind the plan, developed by Armidale Regional Council, to upgrade the area and has requested the NSW Government contribute $459,182 to undertake the work. 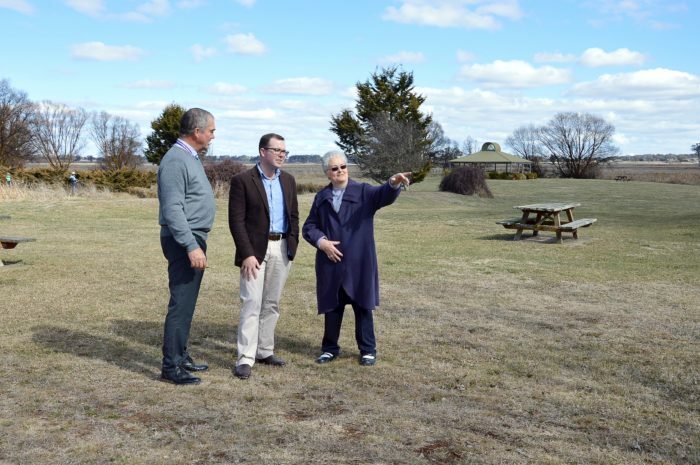 “The Mother of Ducks Lagoon and Nature Reserve is one of the most beautiful public park areas in the Guyra district – it is truly one of our tourism gems,” Mr Marshall said. “The reserve is rarely empty, with locals and visitors coming here to enjoy the stunning natural vista which even in our current dry season is still a beautiful sight. Created as part of an Australian Bicentenary project in 1988, Mr Marshall said many of the lagoon’s facilities were looking old and tired. He said the toilet block was too small for the numbers of visitors the lagoon attracted, there were not enough shade shelters, the interpretive signage required updating, the walking tracked were desperate for improvements as well as a need for public barbecue facilities. “All of these deficiencies take away from what could be Guyra’s key attraction which is why I’m getting fully behind Armidale Regional Council’s upgrade plans for the reserve,” Mr Marshall said. “New electric barbecues, weather-proof picnic tables, a brand new amenities block, signage and expanded walking tracks will greatly enhance the attractiveness of the lagoon reserve to tourists. “With even a small two per cent increase in overnight stays at the lagoon reserve, Guyra has the ability to increase visitor expenditure in the town by almost $2.75 million each year. Armidale Regional Council Mayor and Guyra local Simon Murray agrees. “The planned upgrades at the lagoon were identified as a key priority by the Guyra community and council is happy to get behind the idea and push for funding,” Cr Murray said. Mr Marshall said he was determined to see the lagoon upgraded to realise the tourism benefits for the Guyra community. “This will be another great project for Guyra and I’m determined to deliverer the funding for these improvements,” he said.